Hotel Splendid B & B is a 2-star hotel in Milano Marittima family run. Located a short distance from the beach and the pine grove, it has a large garden with a play corner for children, rooms with panoramic balconies, WI-FI in public areas and parking. Accept small animals. 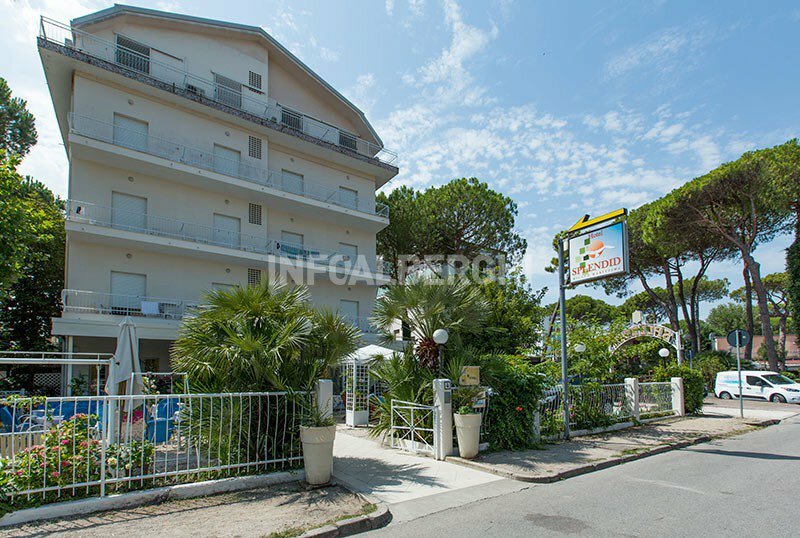 Located in a quiet area, in the VII cross that connects directly the pine grove to the beach of Milano Marittima. The center can easily be reached on foot in about 10 minutes. The rooms have a balcony, air conditioning (on request), safe, telephone, satellite TV and digital terrestrial, private bathroom with shower and hairdryer. Equipped garden with children's playground area, gazebos and tables, free use bicycles, living room with satellite TV and bar, newspapers, elevator and safekeeping service. Organize theme nights. PARKING: parking spaces available until exhaustion. WI-FI: available free in public areas. AIR CONDITIONING: free in the common areas, in the room on request. BREAKFAST: American buffet with sweet and savory dishes. In the hotel: outdoor playground area, strollers and bottle warmers. On request: pediatric counseling. At the restaurant: high chairs and baby food.